I was looking for a nice scene for on top of the my model train mountain, and I had some Airmiles which I had to make up (saved Airmiles only remain valid for 5 years). 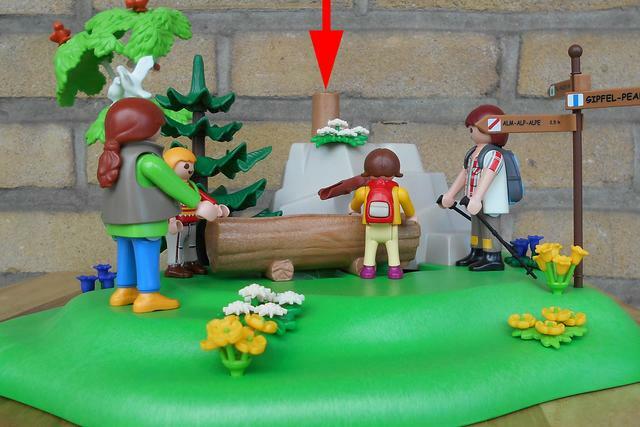 For some time I had seen Playmobil set 5424, which really appealed to me. Often with my walks through the Black Forest or the Mittelgebirge in Germany you often come across this: a water spring in the forest with a hollowed-out tree trunk (sometimes also a stone bowl) to catch the delicious fresh water. After exchange of the Airmiles this set cost me only 1,64 Euro including shipping, a very good bargain, and we Dutch people like to see that. The set comes in a cardboard box, where the small parts are packed separately in plastic bags. That way, those small parts don't get lost. In the unlikely event that this happens, Playmobil offers a service to replace these small parts. This set contains extensive instructions with clear illustrations. Mounting the rock and pump should not be a problem. Once again I am struck by the well-considered design of this set and the eye for detail at Playmobil. The road pointer is made of soft plastic so that it does not break off when knocked over. The bare tree trunk on the rock hides a small pump, which supplies water to the hollow tree trunk. The rock is hollow, and serves as a hidden water supply. Playmobil surprises me every time with the imitation of the flowers, Playmobil should consider making this also in realistic colors for scale G model trains. Many a model house would brighten up with this. — Excellent quality plastic and absolutely weatherproof. — Beautiful design of the flowers. 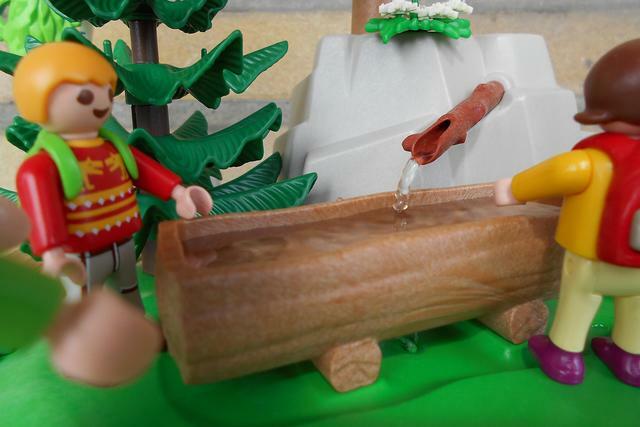 — The water pump really works, but its operation is unfortunately briefly explained in the operating instructions. — Road pointer is made of soft plastic so that it does not break off when impacted. — Such a water source invites you to take a fresh sip, why not add cups to this set? — Excellent for model railroads, but this must be painted/brushed over in realistic colours. Always a nice scene, a natural water source in a mountain. The water source really works, in the rock there is a water pump and a water supply hidden. The whole forms a closed circuit. For the handy craftsmen it should not be difficult to replace the water pump with the electric water pump from Faller. 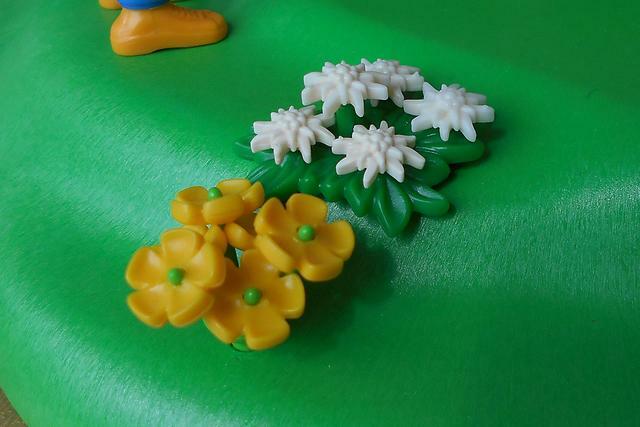 Playmobil always surprises me with the reproduction of flowers. Idea to release a set for model railroads? A nice review of a nice set, Marco. I bought this set last year or maybe the year before with a view to use it with the railway, but haven't done so far. I quite agree about the poor instructions on using the pump. I tried to take the set apart when I first tried fill the pump, and only then realised that I could fill it by filling the trough.